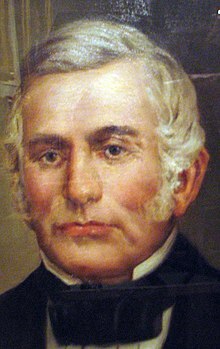 Lilburn Williams Boggs (December 14, 1796 – March 14, 1860) was the sixth Governor of Missouri from 1836 to 1840. He is now most widely remembered for his interactions with Joseph Smith and Porter Rockwell, and Missouri Executive Order 44, known by Mormons as the "Extermination Order", issued in response to the ongoing conflict between members of the Church of Jesus Christ of Latter Day Saints and other settlers of Missouri. Boggs was also a key player in the Honey War of 1837. Lilburn W. Boggs was born in Lexington, Fayette County, Kentucky on December 14, 1796, to John McKinley Boggs and Martha Oliver. Boggs served for 18 months with the Kentucky troops during the War of 1812. He moved in 1816 from Lexington, Kentucky to Missouri, which was then part of the Louisiana Territory. In Greenup County, Kentucky, in 1817, Boggs married his first wife Julia Ann Bent (1801–1820), a sister of the Bent brothers of Bent's Fort fame, and daughter of Silas Bent, then a judge in the Missouri Supreme Court. She died on September 21, 1820 in St Louis, Missouri. They had two children, Angus and Henry. In 1823, Boggs married Panthea Grant Boone (1801–1880), a granddaughter of Daniel Boone, in Callaway County, Missouri. They spent most of the following twenty-three years in Jackson County, Missouri, where all but two of their many children were born. Boggs started out as a clerk, then entered politics. He served as a Missouri state senator in 1825 to 1832; as lieutenant governor from 1832 to 1836; governor from 1836 to 1840; and again as state senator from 1842 to 1846. He was a Democrat. ...open and avowed defiance of the laws, and of having made war upon the people of this State ... the Mormons must be treated as enemies, and must be exterminated or driven from the State if necessary for the public peace—their outrages are beyond all description. The order was rescinded on June 25, 1976, after nearly 138 years, by Missouri Governor Christopher Bond, who declared that the original order violated legal rights established by the U.S. Constitution. In rescinding the order, Bond offered his regrets on behalf of the state. Marker on the Mormon Walking Tour commemorating the spot where Boggs house was located. The marker is in a cleared patch of snow on the sidewalk (to the left of the blow up). The Independence Temple steeple can be seen in the trees at the top of the hill. Boggs, who was from Independence, moved to a house within the City of Zion plot in Independence after the Mormons were evicted from Missouri and after he left office. His home was three blocks east of Temple Lot. On the rainy evening of May 6, 1842, Boggs was shot by an unknown party who fired at him through a window as he read a newspaper in his study. Boggs was hit by large buckshot in four places: two balls were lodged in his skull, another lodged in his neck, and a fourth entered his throat, whereupon Boggs swallowed it. Boggs was severely injured. Several doctors—Boggs' brother among them—pronounced Boggs as good as dead; at least one newspaper ran an obituary. To everyone's great surprise, Boggs not only survived, but gradually improved. The crime was investigated by Sheriff J.H. Reynolds, who discovered a revolver at the scene, still loaded with buckshot. He surmised that the suspect had fired upon Boggs and lost his firearm in the dark rainy night when the weapon recoiled due to its unusually large shot. The gun had been stolen from a local shopkeeper, who identified "that hired man of Ward's" as the "most likely culprit". Reynolds, then acting on the testimony of the storekeeper, determined that the man in question was Orrin Porter Rockwell, a close associate of Joseph Smith. Reynolds eventually caught Orrin Porter Rockwell and held him for almost a year while he awaited trial. Reynolds could not produce any evidence that Rockwell was involved in any way and he was acquitted of all charges concerning Boggs, after prominent lawyer Alexander Doniphan agreed to defend him. A few people saw the assassination attempt positively: an anonymous contributor to The Wasp, a pro-Mormon newspaper in Nauvoo, Illinois that was not supported by the LDS Church, wrote on May 28 that "Boggs is undoubtedly killed according to report; but who did the noble deed remains to be found out." Rockwell denied involvement in oblique terms, stating that he had "done nothing criminal". Also at about this time, John C. Bennett reported that Smith had offered a cash reward to anyone who would assassinate Boggs, and that Smith had admitted to him that Rockwell had done the deed. He went on to say that Rockwell had made a veiled threat against Bennett's life if he publicized the story. Joseph Smith vehemently denied Bennett's account, speculating that Boggs — no longer governor, but campaigning for state senate — was attacked by an election opponent. Mormon writer Monte B. McLaws, in the Missouri Historical Review, supported Smith, averring that while there was no clear finger pointing to anyone, Governor Boggs was running for election against several violent men, all capable of the deed, and that there was no particular reason to suspect Rockwell of the crime. This opinion was not shared by Rockwell's most noted biographer, Harold Schindler. Whatever the case, the following year Rockwell was arrested, tried, and acquitted of the attempted murder (Bushman, p. 468), although most of Boggs' contemporaries remained convinced of his guilt. Boggs traveled overland to California in 1846 and is frequently mentioned among the notable emigrants of that year. His traveling companions widely believed that his move was rooted in his fear of the Mormons. When the train set out in early May, he campaigned to be elected its captain, but lost to William H. Russell; when Russell resigned on June 18, the group was thereafter led by Boggs. Among the Boggs Company were most of the emigrants who later separated from the group to form the Donner Party. Boggs was accompanied by his second wife Panthea and his younger children as well as his son William and William's bride Sonora Hicklin. They arrived in Sonoma, California in November and were provided refuge by Mariano Vallejo at his Petaluma ranch house. There, on January 4, 1847, Mrs. William Boggs gave birth to a son, who was named Mariano Guadalupe Vallejo Boggs after their benefactor. Lilburn Boggs became alcalde of the Sonoma district in 1847. During the California Gold Rush, Boggs owned a store and did quite well. On November 8, 1849, Boggs resigned as alcalde and became the town's postmaster. Boggs was elected to the California State Assembly from the Sonoma District in 1852. In 1855 he retired to live at Rancho Napa in Napa County, California where he died on March 14, 1860. His widow Panthea died in Napa County, California on September 23, 1880. They are buried in Tulocay Cemetery, Napa, California. His son, Theodore Boggs, would later found the town of Big Bug, Arizona where he fought Apaches during a small encounter at the Big Bug mine. ^ a b "Finding Aid 3.6" (PDF). Missouri State Archives. Archived from the original (PDF) on August 24, 2014. ^ "MISSOURI MORMON WALKING TRAIL MAP – jwha.info – Retrieved February 15, 2010". Jwha.info. Archived from the original on December 24, 2013. Retrieved December 30, 2013. ^ Brodie, Fawn. No Man Knows My History. 323. ^ "Join California". Join California. Retrieved December 30, 2013. ^ "Photos: Historic monuments and mausoleums at Napa's Tulocay Cemetery". Napa Valley Register. Napa, CA: Lee Enterprises, Inc. December 10, 2017. Retrieved December 11, 2017. Boggs, William M. A Short Biographical Sketch of Lilburn W. Boggs, by his son. Johnson, Kristin. "Lilburn W. Boggs." In Unfortunate Emigrants: Narratives of the Donner Party. Logan, Utah: Utah State University Press, 1996. LeSueur, Stephen C. The 1838 Mormon War in Missouri. Columbia: University of Missouri Press, 1990. McLaws, Monte B. "The Attempted Assassination of Missouri's Ex-Governor, Lilburn W. Boggs." Missouri Historical Review, 60.1 (October 1965). Schindler, Harold. Orrin Porter Rockwell: Man of God, Son of Thunder. Salt Lake City: University of Utah Press, 1966. Text of both the Extermination Order and Bond's Executive Order.